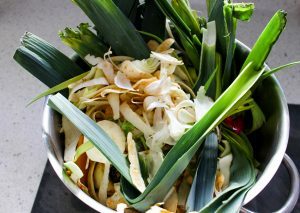 Instead of wasting vegetable peelings, try my vegetable broth recipe. The broth can be used in soups, risottos, casseroles etc. Take any peelings you have, reserving leafy greens like cabbage leaves, sprout peelings, etc until later on (cooking leafy greens for too long will make the broth taste bitter). Place them in a large pot then fill the pot with cold water. Using your hand, stir the peelings around the pot to loosen any soil left on any of the vegetable peelings then drain the pot and re-fill it with more cold water. Bring the pot to a boil on the stove with a good pinch of salt, some pepper and a tablespoon or so of soy sauce (optional). Simmer for about forty minutes then add the green, leafy vegetables and simmer for another five minutes. Drain (reserving the broth of course) and then return the broth to the pan, reducing it by about a third or a half for a more intense flavour. Use the broth in risottos, soups, noodle pots, casseroles, etc or have it in a mug instead of a hot drink. I like to drink mine with some cayenne pepper. Less waste, more goodness.